Iowa State University has conducted food safety research of the beef product deemed “Pink Slime” by the mass public. Lean-finely-texturized-beef (LFTB) is a meat filler made from ammoniated boneless lean beef scraps, connective tissue or similar products, which are considered unfit for human consumption until ammonium hydroxide has been added – due to e.coli and salmonella. It was dog food until the meat industry lobbied its use as meat filler for us. South Dakota-based company Beef Products, Inc. (BPI) filed legal action in 2010 to block records release after they were requested by a Seattle food safety law firm and the New York Times. Last month, District Judge Dale Ruigh upheld the block and ruled that releasing those records would do “irreparable harm” and reveal information about proprietary food-processing techniques. The harm to both company and consumer has already been done. What is so scandalous that we don’t already know? The information they don’t want released involves professor James Dickson of Iowa State University who was hired as a BPI consultant in 2002. But, he has said that his research found that ammonia treatment on meat makes it safer by killing bacteria. Did he find something else? Do the records confess something previously omitted? It doesn’t sound like he has had negative findings. Perhaps BPI anticipated a backlash and filed in 2010 to hold it off. So much for any kind of transparency. For whatever reason, BPI doesn’t want it out there and the judge agrees it would harm the already failing company. BPI had to close down 3 out of its 4 branches. Activist outrage caused grocery and fast food chains to drop LFBT. A disgruntled former employee tried to sue Diane Sawyer, ABC company, Jamie Oliver, and a food blogger for damages, yet it coincides with his book deal about Pink Slime ruining his life – he retracted the lawsuit. The vast public didn’t know about the ammonium gas because the product isn’t labeled as such – it’s considered a part of the process and generally recognized as safe by the government. And that product is mixed into ground beef as a filler, also considered a part of processing. But if a sickness breaks out, it would be impossible to trace – think of the variety of sources cattle ground beef comes from; now think of the filler scraps. The meat industry had the sheer gall to blame the public for finding out (not unlike a Scooby-Doo villain) and for jobs lost. They retaliated by threatening higher prices without the filler. Way to serve. 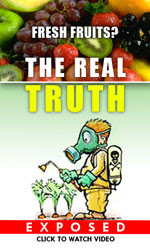 Meanwhile, the real culprits – the FDA and USDA – escaped the PR nightmare. With all the fuss about food safety with the Food Safety Modernization Act and raw milk scare tactics, one would think the FDA and USDA would come down hard on companies whose products could either trigger deadly food sickness or reaction from ammonia treatment. But they continue to protect it and shove it on school children – it’s voluntary, but many budget-strapped schools will continue to serve it in the National School Lunch Program as it has been deemed safe. The Obama administration has imparted hundreds of millions to the FDA for food safety in its newest campaign, which spends millions to harass peaceful farmers and yields to corporate moguls and subsidized darlings. Be the first to comment on "Judge Orders Pink Slime Silence to Protect Company"